The BtS ball-jointed arms the new float system is easy to install, adjustable to suit personal needs, lightweight and very affordable. Each 2" float segment yields up to +4 ounces of buoyancy, so even the heaviest underwater camera system will be "lightened up" substantially. Our floats are manufactured from a new high-tech, high density foam and have been thoroughly tested to well beyond sport diving depths. The BTS Buoyancy floats are packaged to fit the most popular arm combinations. Pick the one that best suits your needs from the drop down menu above. Make your underwater housing, lighter and easier to use underwater! 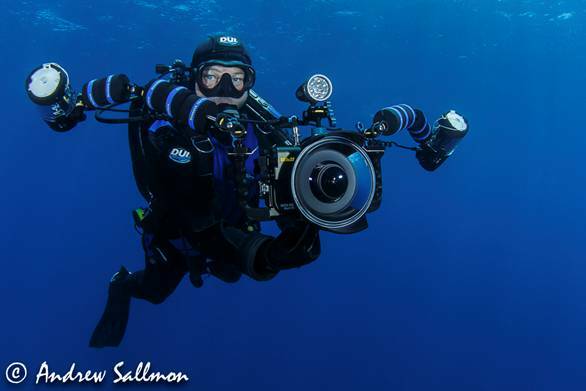 Diver Andy Sallmon's large dSLR rig is so perfectly weighted that he can easily balance it on one finger!